The Wishing For Snow Cowl is the perfect winter knit, with a huge squishy cable running through the middle, surrounded by big baubles! 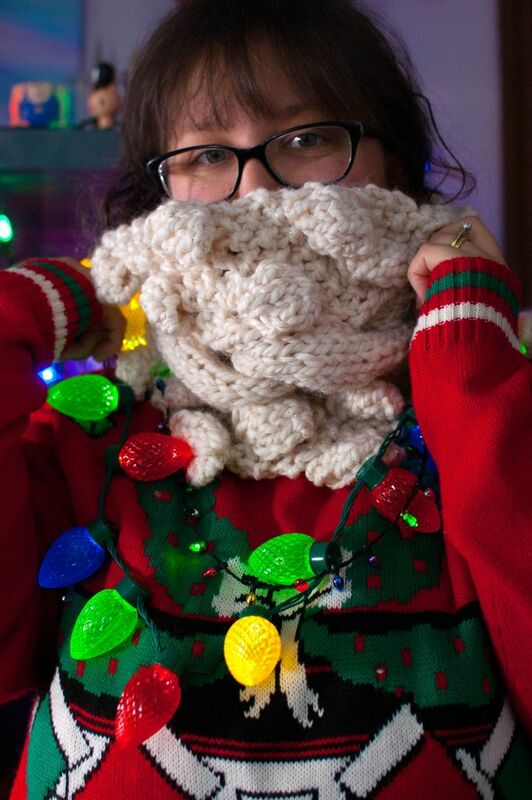 Knitting baubles with super bulky yarn is a fun, cozy treat. Yarn: Lion Brand Yarn Company ‘Wool-Ease Thick & Quick’ (79% Acrylic, 20% Wool, 1% Metallic Polyester, 84 m per 140g skein); 1 skein; sample uses color “Starlight” or find a super bulky yarn that knits up close to gauge. If you want to just start the cowl, make sure your full width is 10.25″/26cm and that your row gauge is coming out about the same as above. If your row gauge is off, use your judgement to add or subtract rows from the completed cowl. The cowl is knitted flat, with both end are sewn together to create a cowl. The first and last seven stitches of each row are in seed stitch (k1, p1 on the right and wrong sides). The middle 12 stitches are knit (purled on the WS) and crossed over every 12th row (6/6 RC). Starting on the 5th row (RS), and every fourth row after that, we’re making a bobble on the 2nd outermost stitches or the second innermost stitches of the seed stitch section (so the 6th and 20th stitches in the row). This will alternate. For example, on the 5th row, we’ll make bobbles on the outside of the seed stitch section, on the 9th row we’ll make them on the inside, on the 13th row, we’ll make them on the outside again, and so on. I decided on 73 rows because that’s what fit my neck and made the spacing between first cable crossover and the last one line up. You can go shorter or longer depending on how much yarn you have! Row 1 and most RS rows: (K1, p1) x 3, k14, (p1, k1) x 3. Row 2 and most WS rows: (K1, p1) x 3, k1, p12, k1, (p1, k1) x 3. Unless specified below, knit your rows as above. Row 5, 13, 29, 37, 53, 61: K1, mb, (k1, p1) x 2, k14, (p1, k1) x 2, mb, k1. Row 17, 25, 41, 49, 65, 73: (K1, p1) x 2, k1, mb, k14, mb, (k1, p1) x 2, k1. Row 9, 33, 57: (K1, p1) x 2, k1, mb, k1, 6/6 RC, k1, mb, (k1, p1) x 2, k1. Row 21, 45, 69: K1, mb, (k1, p1) x 2, k1, 6/6 RC, k1, (p1, k1) x 2, mb, k1. Knit in this pattern for 73 rows, BO, leaving a long tail. Use the tail to stitch together both ends of the cowl. 6/6 RC – Right cross cable. 6/6 RC – Put next 6 sts on cable needle, hold cable needle in back. Knit next 6 sts, knit the 6 sts off of the cable needle. Check out my 2/2 Cable Tutorial you can do the same thing I do in the video, except with 6 and 6 stitches rather than 2 and 2. I hope you have fun knitting this! If you have any questions, comment below! Previous PostPrevious Doctor Who Christmas Special Make-a-long! 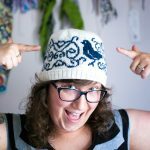 Next PostNext Witch Bolt, A Double Knit Hat – Coming Soon!